As we embrace our passions and drill into the mystery of life, we unite with the noble complexity of nature with us. Ayurveda provides a lot of great tools to bring balance and make life more sustainable. Autumn is the season when Vata dosha – which is the subtle energy that directs movement- becomes powerful. Literally translated as “wind”, Vata is dry. It moves, bursts in and is often cold. Vata rises mainly in autumn, and when it does, it can leave you feeling worn out, fragile and susceptible to illness. 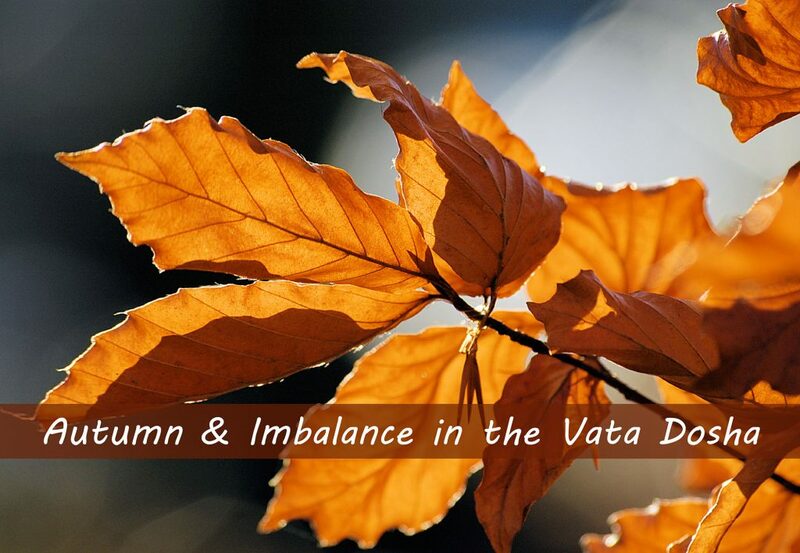 How to Balance Vata in Autumn? Vata dosha is normally provoked by the increase of cold, windy and dry weather. Vata relates to wind, the principle of action governed by the elements of ether and air. Balancing Vata dosha with lifestyle, yoga, herbs, diet and meditation, creates a strong consciousness, enabling a person to live in harmony throughout the daily and seasonal changes. When vata dosha predominates, there will be an increase in the dry, cool and rough qualities of our internal and external environments. In excess, dryness can begin to disturb various tissues and organs. Most noticeably, the energy of vata dosha in the body is variable. Dry skin and lips are an example of excess vata. An internal drying can also occur, particularly in the large intestine and colon, where Vata is likely to first accumulate. Though we all come across the seasonal effects of autumn, people whose physiques are vata-predominant and the elderly, who are in the vata stage of life, are most susceptible to these changes. will help nourish and balance the body. Including carrots, beets, sweet potatoes, pumpkin, acorn, butternut, delicata, and buttercup squashes in diet will make us much healthier. This food has the qualities of heavy, smooth, sweet, moist and dense and balances vata the most. Dry weather enters our body through the pores, the nostrils, the ears, the belly button and the lips. By smearing these openings, you shield yourself from the cold. Before moving on to bed, you can rub a few ounces of warm sesame oil all over your body with special care to the ears, nostrils, and other openings. Take a mouthful of sesame oil, before going to bed and whiz it around, hold for 1–2 minutes, and expel it. Then apply some oil to the index finger and smoothly massage your gums, which is called Kavala. It’s much good for an affected wisdom tooth, sensitive teeth and receding gums and for preventing earaches and cavities. This is a great remedy for those who have dry eyes. While lying on your back, face up, put one drop of castor oil in each eye at bedtime. In the morning your eyes will be humid, pretty, and clear. Nasya can be done twice daily and the practice of Nasya will pacify the vata dosha, reduce snoring and improve vision. It’s also good for dry eyes, sinus congestion, migraines, headaches, neck stiffness, even in spondylitis. Autumn is a very significant season from the health perspective as we are moving from heat to cold and the metabolism changes accordingly. Drinking warm water throughout the day and sipping spiced tea keeps Vata at stake. Vata can be pacified by creating internal heat by gentle exercise and avoiding the excessive use yogurt, alcohol and mustard oil. Avoiding overexposure to mist and sunlight will also help.